The previous primary texts I have examined in relation to the Nigerian jihad scene were written by critics of Abu Bakr Shekau (though both texts present some quotations from Shekau's written and spoken pronouncements). In the interest of fairness, it is worth presenting something entirely in Abu Bakr Shekau's own words. This pamphlet on the meaning of Islam, its contrary, the concept of 'Taghut' and western/foreign schools is a good place to start. The pamphlet was published in February 2017- that is, many months after Shekau's removal from the position of wali (governor) of Islamic State West Africa Province (ISWAP). Of interest is how Shekau describes himself in this pamphlet. He says he is the imam of "Jama'at Ahl al-Sunna lil-Da'wa wa al-Jihad," which was the actual name of Shekau's group (popularly called 'Boko Haram' in media) prior to the allegiance pledge to the Islamic State. Since losing the position as wali of ISWAP, therefore, Shekau has reverted to using the old name for his group. 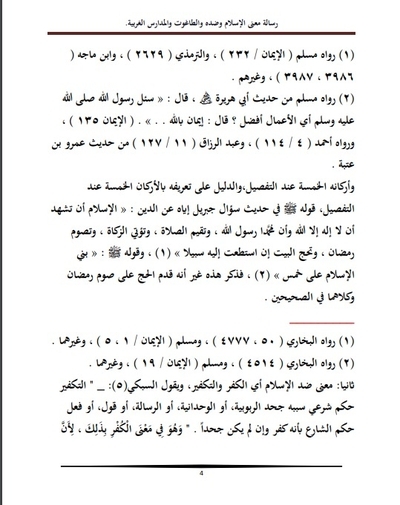 Curiously though, he adds that his group is "in West Africa in the Islamic State," while the title page also features the designation of "The Islamic State for Jama'at Ahl al-Sunna lil-Da'wa wa al-Jihad." What does this mean in terms of Shekau's relationship with the Islamic State that is led by Abu Bakr al-Baghdadi? It is certainly true, as Thurston notes, that Shekau has appealed to the Islamic State's central leadership against ISWAP and has claimed that he has been misunderstood. 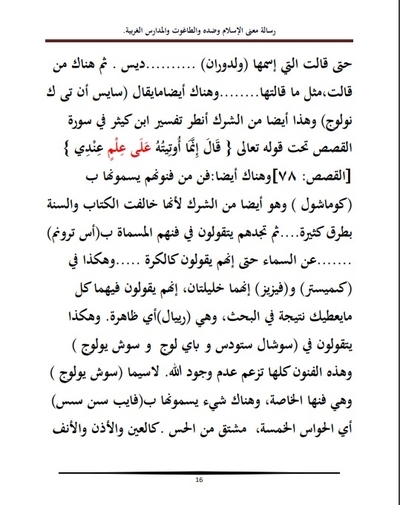 However, nowhere does this pamphlet reference an allegiance from Shekau to Abu Bakr al-Baghdadi or claim that his group is the real wilaya ("province") of Abu Bakr al-Baghdadi's Islamic State. 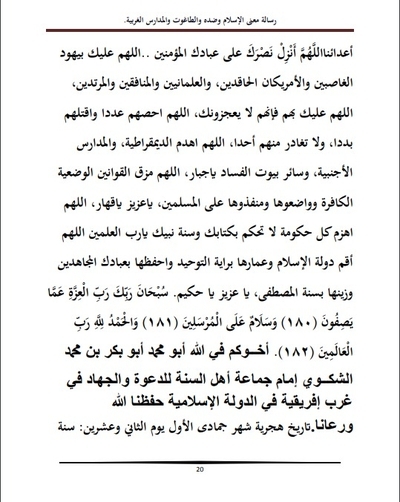 Notably, the conclusion of the pamphlet asks God to establish the dawlat al-islam ("Islamic State") as though it does not actually exist on the ground. 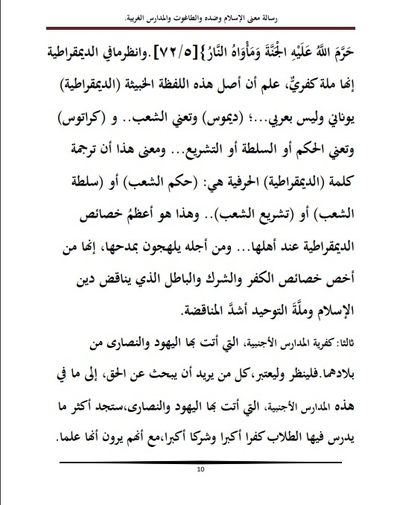 Considering that this pamphlet can be seen as a '101' of the ideological agenda of Shekau's group, surely there would have been an affirmation of an allegiance to Abu Bakr al-Baghdadi if he considered it to be a legitimate authority over him? The interpretation here that seems most plausible to me is that Shekau sees his group as embodying the only real Islamic state project in West Africa. At the same time it is possible he sees Abu Bakr al-Baghdadi's Islamic state project as having Islamic legitimacy but not having authority over him. 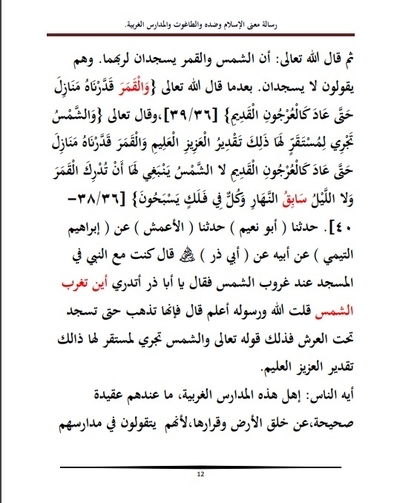 That would accord with one of ISWAP's criticisms of Shekau: namely that he apparently believes in jawaz ta'addud al-a'ima ("permissibility of the multiplicity of imams") on analogy with the Mamluks, Abbasids and Umayyads. 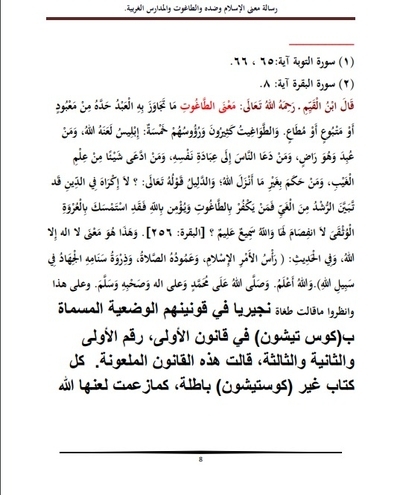 Besides this issue of the Shekau's relationship with Baghdadi, the pamphlet is also useful for understanding the basic creed of Shekau and his followers. From the extended invective against western/foreign-style schools, one can get some understanding of the origin of the popular media name 'Boko Haram' ('Western education/ideas are forbidden'), though it would be mistaken to think that 'Boko Haram' was somehow a single-issue group. Rejection of Western/foreign-style schools that teach various subjects that contradict Islam in the view of Shekau and his followers is just one aspect of the ideology. Another crucial component of the ideology- as outlined in this pamphlet- is rejection of 'man-made laws'. Many of the views espoused by Shekau in this pamphlet regarding those schools come from Muhammad Yusuf, who led 'Boko Haram' prior to Shekau. Stylistically, this pamphlet partly reflects Shekau's tendency to ramble. 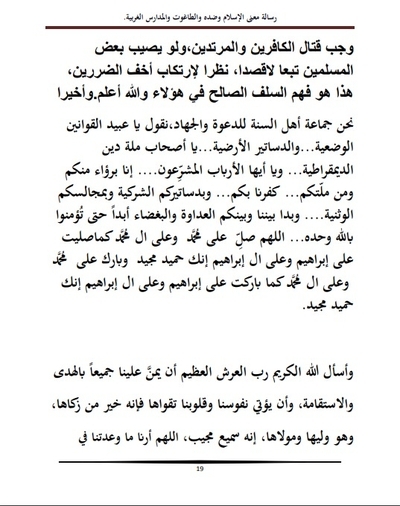 He is by no means a master in Arabic prose composition, and some of the phrasing seems rather awkward. There also appear to be some instances in the text of unclear transcription of English words in Arabic characters. I have marked with a [?] where necessary these instances and any other phrasing that is difficult to understand. I would invite readers to make suggestions by contacting me. That said, in most of the cases where this problem occurs, the point Shekau is making is comprehensible (e.g. in reference to geology, he objects to how the study of the formation of the earth conflicts with the Qur'an's account of the creation of the earth in a timescale of days). Thanks to Jacob Zenn who first highlighted this work by Shekau to me. The truest talk is the Book of God and the best guidance the guidance of Muhammad (SAWS), and the evil of affairs are their new contrivances for every new contrivance is an act of innovation and every innovation is error and every error is in hellfire. And also: we ask God Almighty, Lord of the Great Throne, to place us among His just, pious servants who attain His mercy and grace and Paradise. And we ask Him- great is His power- to deal with us and overlook us on the Day of Judgement by His mercy and grace, not His justice. Allahum amin. 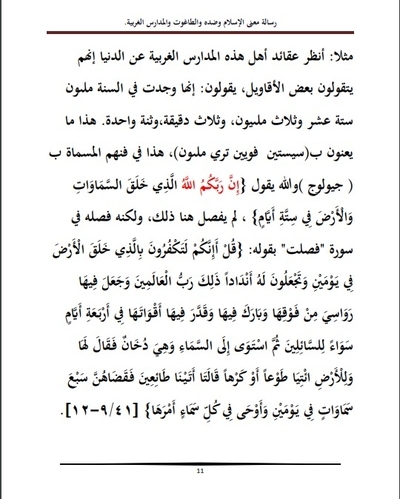 We will take what the Book and Sunna have shown, and the words of the Imams of the Ahl al-Sunna wa al-Jama'a, concerning the meaning of Islam, its contrary and Taghut, and the evidence of the kufr of these foreign schools in which doctrines of kufr and shirk are taught, and they are the schools brought by the Jews and Christians from their land. And it is not that all who have pronounced there is no deity but God are Muslims, when they associate partners with God. And we do not kill anyone except the one whom God kills. And we do not declare takfir on anyone except the one on whom God Almighty declares takfir in the Book of the Exalted and Almighty. First: what is the meaning of Islam? Islam is degrees, and the degrees of the religion of Islam are three: Islam, faith an ihsan. And each one of them, when applied, encompasses the religion entirely. 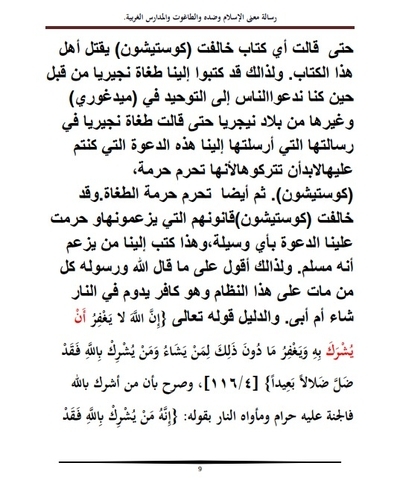 As for its meaning: submission to God in tawheed, and submitting to Him in obedience, and being rid of shirk. God Almighty has said: "And the best in religion is the one who submits his face to God." And the Almighty has said: "And the one who submits his face to God and is muhsin in intention, he has clung to the indissoluble bond." And the Almighty has said: "For your God is one God, for submit to him and give glad tidings to the humble." And the evidence for its encompassing the religion entirely on application is the words of God Almighty: "Religion in God's eyes is Islam." And the Prophet (SAWS) said: "Islam began strange and will return strange as it began" (narrated by Muslim on al-Imaan/232 and al-Tirmidhi 2629 and Ibn Majeh 3986 and 3987 and others). And SAWS said: "The best of Islam is faith in God." And many things besides that (narrated by Muslim from the hadith of Abu Huraira- may God be pleased with him. He said: 'The Messenger of God (SAWS) was asked what deeds are best. He said: faith in God...'- al-Imaan 135; also narrated by Ahmad 4/114 and Abd al-Razzaq 11/127 from the hadith of Amro bin Utba). And Islam's five pillars on detailing: and the evidence on its definition of the five pillars on detailing is the words of SAWS in a hadith of Gabriel's question to him about the religion: "Islam is that you bear witness that there is no deity but God and Muhammad is the Messenger of God, and you establish prayer, give zakat, fast in Ramadan, and perform Hajj of the house if you can do so" (narrated by Bukhari 50, 4777 and Muslim al-Imaan 1, 5 and others). And SAWS' words: "Islam has been built on five things" (narrated by Bukhari 4514 and Muslim al-Imaan/19 and others besides him). So he mentioned these things but he put the Hajj before the Ramadan fasting and both of them are in the Sahih collections. Second: the meaning of the contrary of Islam i.e. kufr and takfir. 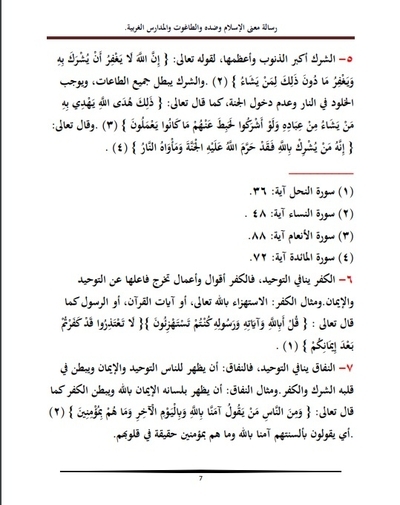 And al-Subki (5) says: "Takfir is a Shari'i ruling whose cause is opposition to al-Rabubiya or al-Wahdaniya or the message, or saying or doing something which the Legislator rules to be kufr even if it is not opposition. And it is the meaning of kufr in that, because faith as word without meaning is of the kind of faith of the People of the Book, as the Almighty said: "The similitude of those who were burdened with the Torah then they did not bear it is the donkey bearing books." And the Almighty said: "And among those are the illiterate who do not know the Book except in wishful thinking"- i.e. except recitation without understanding its meaning. And this is not as the believer who has understood what he has understood from the Qur'an and implemented it, and some it has appeared obscure to him so he has entrusted his knowledge to God as the Prophet (SAWS) commanded him in his words: "What you have known from it, implement it, and what you have been ignorant of, refer it to one knowledgeable about it." So he has followed what SAWS commanded him in his words: "And the religion of God on earth and heaven is one, and it is the religion of Islam." God Almighty has said: "Religion in God's eyes is Islam" (Al Imran 19) and the Almighty has said: "I have been content with you in Islam as religion" (al-Ma'ida 3). And it is between [extremism and] shortcoming, and between anthropomorphizing and denying attributed to God, and between al-Jabr and al-Qadr, and between security and despair. It has been established in the authentic hadith on the authority of Abu Huraira (may God be pleased with him) on the authority of the Prophet (SAWS) that he said: "The religion of us- the people of the Prophets- is one." And the Almighty said: "And whoso desires a religion besides Islam, it will not be accepted from him" (Al Imran 85). General in every age, but the rituals differ as the Almighty has said: "For each one of you We have put in place a law and manhaj" (al-Ma'ida 48). 1. The first thing God imposed on the son of Adam is kufr in Taghut and faith in God, as the Almighty has said: "And We have sent messengers among every nation that they should worship God and avoid Taghut" (al-Nahl 36). 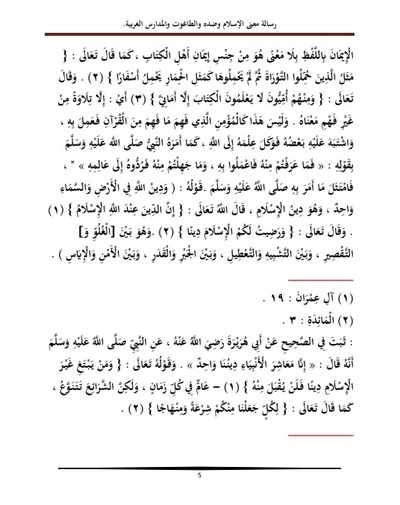 And as for the meaning of faith in God: it is that you believe that God is the god to be worshipped alone without one besides him, and all types of worship be devoted entirely to God, and you deny them from everything worshipped besides Him, and you love the people of purity and are loyal to them, and you hate the people of shirk and are hostile to them. And this is the path of Ibrahim: the one who loathes it discredits himself. And this is the model about which God told in the Almighty's words: "And there was for you a good example in Ibrahim and those who were with him when they said to their people: we disavow you and what you worship besides God. We have disavowed you and hostility and enmity between us and you has appeared forever until you believe in God. 2. Meaning of Taghut: all that is worshipped besides God and is content. 3. 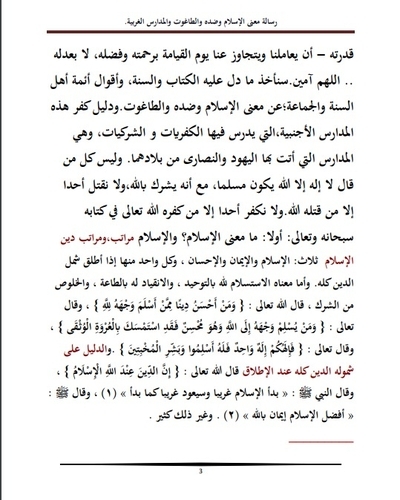 Quality of kufr in Taghut: that you believe the worship of one besides God Almighty is wrong and you abandon it and hate it, and you declare takfir on its people and are hostile to them. 4. Shirk vs. Tawheed: the latter is giving God Almighty alone the right to be worshipped, while shirk is engaging in one of the acts of worship to one besides God Almighty, like calling on one besides God, or prostrating to one besides God. 5. Shirk is the greatest and most serious of the sins, for the Almighty said: "God does not forgive associating partners with Him but He forgives the one He wills for what is besides that" (al-Nisa' 48). And shirk nullifies all the acts of obedience, and obligates abiding for eternity in the hellfire and not entering Paradise, as the Almighty said: "That is the guidance of God, by which He guides the one He wills from His servants. If they commit shirk, what they have done is rendered for nothing" (al-An'am 88). And the Almighty said: "Whoso associates partners with God, God forbids him from Paradise and his abode is the hellfire" (al-Ma'ida 72). 6. 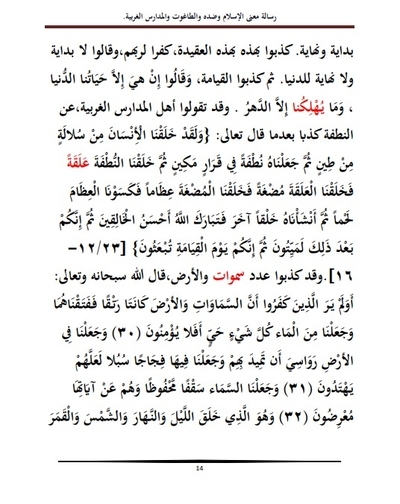 Kufr is the contrary of Tawheed, for kufr are words and deeds that take their doer outside tawheed and faith, and the example of kufr: mocking God Almighty, the verses of the Qur'an or the Messenger, as the Almighty said: "Say: were you mocking God, His verses and His Messenger? You will not be excused. You have disbelieved after your faith" (al-Tawba 65-66). 7. Hypocrisy is the contrary of Tawheed, for hypocrisy is showing to the people Tawheed and faith and harbouring one's heart shirk and kufr, and the example of hypocrisy: is that he professes on his tongue faith in God and harbours within him kufr as the Almighty said: "And among the people are those who say: we have believed in God and the Last Day. But they do not really believe" (al-Baqara 8): i.e. they say on their tongues we have believed in God but they do not really believe in their hearts. Ibn al-Qayyim- may God Almighty have mercy on him- said: "The meaning of Taghut: that by which man has exceeded his limit from what is worshipped, followed or obeyed, and the Tawagheet are many and their heads are five: Iblis (God's curse be upon him), whoso is worshipped and is content, whoso calls on the people to worship himself, whoso claims something from knowledge of the unseen, and whoso rules by something besides what God has revealed. And the evidence is the words of the Almighty: there is no compulsion in religion. The right has become distinguished clearly from the wrong. Whoso disbelieves in Taghut and believes in God has clung to the indissoluble bond that has no breaking in it. And God is hearing, knowledgeable" (al-Baqara 256). And this is the meaning of there is no deity but God, and in the hadith: "The head of the matter is Islam, and its pillar is prayer and its pinnacle is jihad in God's path." And God knows best, and God's blessings and salutations be upon Muhammad, his family and companions." And on this basis, see what the Tughat of Nigeria have said in their man-made laws, the so-called constitution, in the first law, no. 1, 2 and 3. This accursed law has said: "Every document besides the constitution is invalid," just as this- may God's curse be upon it- has claimed, nay asserted, that any book that has contravened the constitution- the people of this book are to be killed. And therefore the Tughat of Nigeria wrote to us before when we were calling the people to Tawheed in Maidaguri and other parts of the land of Nigeria such that the Tughat of Nigeria said in their message that they sent to us: this da'wa you have been upon, you must abandon it, because it denies the inviolability of the constitution, and then also it denies the inviolability of the Tughat. And it contravened the constitution- their law that they claim- and the da'wa by any means was forbidden to us. And this was written to us by the one who claims that he is a Muslim. Therefore I say on the basis of what God and His Messenger said that all who die on this regime and is a disbeliever will abide in the hellfire forever, whether he wishes or not. And the evidence is the words of the Almighty: "God does not forgive associating partners with Him and He forgives the one He wills for what is besides that. And the one who associates partners with God has gone far astray" (4/116). And He made clear that the one who associates partners with God, Paradise is denied to him and his abode is the hellfire as He said: "The one who associates partners with God, Paradise is denied to him, and his abode is the hellfire" (5/72). And consider what is in democracy: it is a path of kufr. It is well-known that the origin of this evil word democracy is Greek and not Arabic: demos, meaning the people, and kratos meaning the rule or authority or legislation. And the meaning of this is that the literal translation of the word democracy is the "rule of the people" or "authority of the people" or "legislation of the people"- and this is the greatest of the particulars of the democracy in the view of its people, and for this reason they sing its praise. It is among the most particular aspects of kufr, shirk and falsehood that contravene the religion of Islam and the path of Tawheed in the strongest way. Third: The kufr nature of the foreign schools that the Jews and Christians have brought from their lands. Let all who wish to search for the truth examine and consider what is in these foreign schools that the Jews and Christians have brought. You will find that most of what the students are taught in them is greater kufr and greater shirk, despite the fact that they consider that to be knowledge. For example: look at the creeds of the people of these western schools about this world. Indeed they say some foolish things. They say: that it was created in the year 1 million, 16 and 3 million, 3 minutes and one second [?]. And this is what they mean by [....?] this is in their so-called science of "geology" and God says: Indeed your Lord is God who created the heavens and earth in six days. He did not explain that here, but He explained it in the chapter Fussilat with His words: "Say: indeed you disbelieve in the One who created the earth in two days and you attribute to Him equals? That is the Lord of the worlds. And He placed mountains over the earth and blessed it and determined in it the sustenance of it in four days without distinction: for those who ask. Then He directed Himself to heaven while it was smoke and said to it and the earth: come, willingly or by compulsion. The two said: We have come willingly. And He completed them as seven heavens in two days and inspired in each heaven its matter" (41/9-12). Then God Almighty said: that the Sun and Moon bow down to their Lord. And they say they do not bow, after what God Almighty has said: "And the Moon, We have reckoned it in phases until it returns like the old-date stalk" (36/39). And the Almighty has said: "And the Sun runs to a fixed point for it as determined by the Almighty, the Knowing. And the Moon, We have reckoned it in phases until it returns like the old-date stalk. The Sun is not allowed to reach the Moon, and the night does not overtake the day. Each of them swims in an orbit" (36/38-40). Abu Na'im told us that al-'Amash told us on the authority of Ibrahim al-Timi from his father from Abu Dhir (may God be pleased with him). He said: I was with the Prophet in the mosque at sunset so he said: oh Abu Dhir, do you know where the Sun sets? I said: God and His Messenger know best. He said: it goes to prostrate under the throne, for that is the words of the Almighty, and the Sun runs to a fixed point for it. That is the determination of the Almighty, the Knowing. Oh people: the ilk of these Western schools do not have a true doctrine about the creation of the earth and its fixation because they make false pronouncements in their schools that the earth moves after what the Almighty said: "Isn't He the One who fixed the earth and within it placed rivers and made for it mountains and made a barrier between the two seas? Is there a deity with God? Indeed most of them do not know. Isn't He the One who responds to the one in need when he calls on Him and removes evil..." (27/59-62). And the Almighty has said: "God is the One who has placed for you the earth firmly set and the heaven as an edifice over it" (Ghafir 64). And the Almighty has said: "And He has set mountains on the earth, lest it shift with you, and rivers and roads, so perhaps you will be guided" (al-Nahl 15). And also they make false claims in their so-called science of biology: that the sperm-drop is not dead, but they claim something they have called micros after God Almighty said in His book that it is dead. And likewise on the descent of rain. And God says He brings down rain from the sky as the Almighty has said: And God has brought down water from the sky by which He has brought life to the earth after its death. Indeed in that is a sign for people who hear (65). But they say it comes from the earth. "And had the people of the villages believed, We would have opened up for them blessings from the sky and earth." And when the Almighty said that the earth has a beginning and end, they have proclaimed falsehood in this doctrine out of kufr against their Lord, and have said the world has no beginning or end. Then they have proclaimed the resurrection to be false, and said that there is no life except our worldly life and only time destroys you. And the people of the western schools have pronounced falsehoods about the sperm-drop after what God Almighty has said: "And We have created man from an extract of clay, then We placed him as a sperm-drop in a firm place, then We made the sperm-drop a clinging clot, then We made it a lump of flesh, then We made it bones, and We covered the bones with flesh. Then We established him as another creation. Thus is God blessed as the best of creators. Then indeed you after that will be dead, then on the Day of Judgement you will be resurrected" (23/12-16). And they have pronounced the number of heavens and the earth to be false. God- the Exalted and Almighty- has said: "Or have those who have disbelieved not seen that the heavens and the earth were joined together, so We separated them and made from water every living thing. So they will not believe? And We place on the earth mounts lest it should shift with them, and We made in the mountains passes. Perhaps they will be guided. And We made the sky as a protected ceiling even as they turn away from its signs. And it is He who created the night and day and sun and moon and they all swim in an orbit" (21/30-33). But the people of the western schools contravene this doctrine and others in the Qur'an. And these falsehoods they pronounce in their science they call mathematics i.e. the science of counting. There is something they call 'countable/countless' such that they have given the example of the sky on the basis that it is one. God Almighty is well elevated above that! And they have another doctrine: their falsehood in sociology on the basis that God- Exalted and Almighty is He- does not exist. God Almighty is well elevated above that! Oh people: the people of these Western foreign schools (i.e. Boko) have contravened the religion of God (Exalted and Almighty is He), the religion of Islam, such that their group that they call You Live [?] that you find on their street contravenes the Sunna of our Messenger (SAWS) because they allow left first before the right, and even one of their advocates said in his book called Define Boko such that he said in the Hausa language that the aim of these schools is that the people should be Muslims in name and disbelievers in truth. Then in the end for these people of the school: they worship hellfire. They say: "Find Mountain" [?]. Even the one whose name is [...?] said this [?]. Then there is the one who said like what [...?] has said. Then there is also what is called science and technology. This is also from shirk: see the tafsir of Ibn Kathir in Surat al-Qisas under the Almighty's words: "He said: rather I have been given it on the basis of knowledge I have" (al-Qisas 78). And also: one of their sciences they call commercial, and it is also from shirk because it has contravened the Book and Sunna in many ways, then you find them making false pronouncements on their so-called science of Astronomy about the sky, such that they speak of it as a ball, and likewise in chemistry and Physics. The two are companions. Indeed they pronounce regarding them that all that gives you is a result in investigation, and it is 'real'- i.e. apparent. And in the same way they make false pronouncements in social studies and biology and sociology. And all of these sciences assert the lack of God's existence, especially sociology, and it is its own special science. And there is something they call the five senses, derived from feeling, like the eye, ear, nose, mouth and hand. And likewise they have not believed in qadr. If something happens by qadr, you find them saying "because of [?] causes" Then consider these girls who go to their western schools. Is it possible for this to be permissible after what our Messenger (SAWS) said? It is not allowed for a woman believing in God and the Last Day to travel a distance of a day or night without a mahram. And after this hadith, you leave your girl in the university sitting for four years, after she has finished some of the schools in some years. What do you say about this? The Sheikh of Islam Ibn Taymiyya (may God have mercy on him) said: "And when man permits the forbidden- that is, forbidden by consensus- or forbids what is permitted- that is, permitted by consensus- or alters the law- that is, law by consensus- he is an apostate disbeliever by agreement of the jurists." It is obligatory to fight the disbelievers and apostates, even if it strikes some of the Muslims unintentionally as a result, in view of committing the lesser of two evils. This is the understanding of the just predecessors regarding these people. And God knows best." And finally, we the Jama'at Ahl al-Sunna lil-Da'wa wa al-Jihad, say oh servants of the man-made laws and earthly constitutions, oh companions of the path of the religion of democracy, oh legislating masters, we disavow you and your path. We have disavowed you, and your constitutions of shirk and councils of idolatry, and between us and you have arisen enmity and hatred forever until you believe in God alone. Oh God bless Muhammad and the family of Muhammad just as You blessed Ibrahim and the family of Ibrahim. You are praiseworthy, glorious. And convey Your blessings on Muhammad and the family of Muhammad just as You conveyed Your blessings on Ibrahim and the family of Ibrahim. Indeed You are praiseworthy, glorious. And I ask God the Noble Lord of the Great Throne to bless us all with guidance and correctness, and give our souls and hearts their tawqa. Indeed He is the best of those who have augmented them, and He is their trustee and Lord. Indeed He hears and responds. Oh God, show us what You have promised us against our enemies. Oh God, bring down Your victory on Your believing servants. Oh God, destroy the violating Jews and hateful Americans, and the secularists and hypocrites and apostates. Oh God, destroy them, for they cannot weaken You. Oh God, count them in number and kill them in dispersal, and do not let any one of them escape. Oh God, destroy democracy, the foreign schools, and the rest of the houses of corruption, oh Jabbar. Oh God, tear up the man-made laws of kufr and those who put them in place and implement them on the Muslims, oh mighty vanquisher. Oh God, defeat every government that does not rule by Your book and Sunna of Your Prophet oh Lord of the Worlds. Oh God, establish the Islamic State and its building with the banner of tawheed, and protect it through Your mujahideen servants and adorn it with the Sunna of al-Mustafa, oh mighty, oh wise One. Exalted is your Lord, the Lord of might, above what they describe. And peace be upon the Messengers, and praise be to God the Lord of the Worlds (37:180-182). Your brother in God Abu Muhammad Abu Bakr bin Muhammad al-Shekawi, Imam of Jama'at Ahl al-Sunna lil-Da'wa wa al-Jihad in West Africa in the Islamic State, may God protect us and guide us. 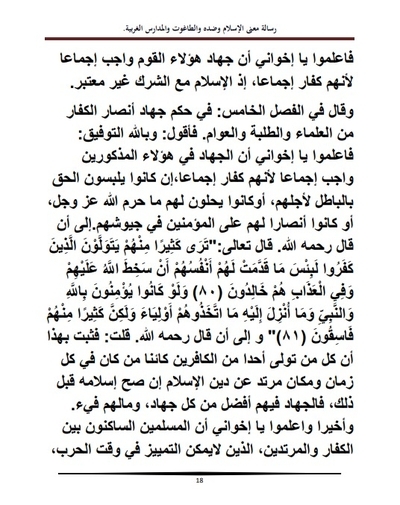 Hijri date: 22 Jumada al-Awal 1438 AH. The Islamic State for Jama'at Ahl al-Sunna lil-Da'wa wa al-Jihad.